I used to use mine for running/the gym but it gets rather annoying due to the 2GB of space. As OP mentioned, could be good for a child or a young person if you'd rather not trust them with a newer/expensive iPhone/iPod. A) yellow sticker store specific B) does not everybody’s phone out perform these? Not worth the price of the yellow sticker let alone the price on the yellow sticker. Good deal, also can't get these anymore so best snap this up! What i mean is apple don't make these anymore i believe. Pointless bit of kit unless you desperately need one. It’s too old tech for today’s market. Why does WhatHiFi? Rate it so highly? Cirrus Logic chips are quality. The interface is the buttons, as is the Sansa, for what it's designed for this is ideal. sound wont be that good and only two gb and no interface. But that's a shuffle. Its ok i guess it depends how far you want to take it sansa clip etc. Excellent device no need for frills; ideal for the gym and takes a battering, I am happy with mine after about 8 years of use. Hot. heat added. I have this one for one year now. Very good for running time. Just picked the last space grey iPod shuffle from tesco Lunsford park. Should be national the guy said. Op do you have barcode? Has anyone been able to pirchase one of these? Don't last long. Had 2 didn't last 12 months. I haven't used iTunes for years - use alternative software to make and transfer playlists or iCloud. I love Apple but iTunes has always sucked. It's a nice apple product but as a fanboy this ideal for the gym instead dumping your music collection on with only 2gb. Good for running too/weight training/gift. For the same price you can get a Sansa Clip + 64gb MicroSD card https://mobymemory.com/uk/kingston-64gb-microsdxc-45mb-s-class-10-uhs-i-memory-card-adapter.html? Clearly this is the one to go for: [img]http://argos.scene7.com/is/image/Argos/4475837_R_Z001A?$TMB$&amp;wid=312&amp;hei=312[/img] Never be embarrassed by your lack of power. It even takes a replaceable AAA battery. Not to try and pick holes in your argument but when I've clicked on the link, the people on that list aren't Apple employees. Plus I suspect 'evangelist' is one of these new-fangled corporate buzzwords - have a search on LinkedIn for the number of people with titles such as 'creative disruptor'. I had someone add me a few months ago who's got 'Sales Wolf' in his title. I bet the issue with the negative feelings towards Apple, is the way this specific has been promoting itself, going as far as having sales person with ludicrous title as "evangelist" &gt; https://www.linkedin.com/title/apple-evangelist When a company, regardless of the quality of its actual product, start to think in those terms, there are serious question that will arise about buying and therefore financing them. Ive been a member here for quite a few years now and i have seen this become quite an aggresive and unsavoury environment. As mentioned above, civilised suggestions wouldnt go a miss... Its plain obvious when the apple hate brigrade are out to play though. i went for the nano, but the other models vary in prices. in kirkcaldy they were cheapest, in glenrothes they were £10-20 on top of that. all dependent on how much stock was left. I got given one of these and was horrified at how poor the sound quality was, even compared to other Apple devices. There is a marked difference which made the music muddy and lack fidelity. Couldn't stand it for more than a few times and never used it again. Also I cannot believe they can even sell something like this in 2015 when in the early 2000's MP3 players this size where far superior. I have one which has a screen, eq, radio, voice recording, radio recording it's made in South Korea with stunning sound, I still use it everyday for gym / jogging etc. 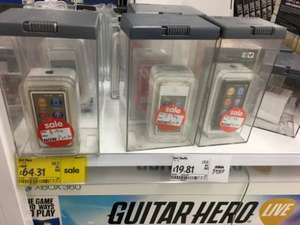 Apple removed the iPod classic and its doing the same with the cheapest iPod shuffle so get yours before they disappear. New post so be nice please. How would the iwatch replace a small MP3 player that's fantastic for use on runs and in the gym? 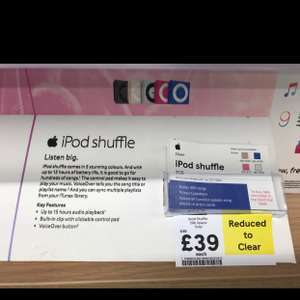 Never miss a 'iPod Shuffle' deal again! I ordered on Saturday and refunded today as out of stock. Sad times as needed one for my daughter's Christmas present. New iPod Shuffle 2GB Purple £19.99! Free click and collect too! You will get delivered a box and before you open it the iPod Shuffle will both be and not be in the box. It is still showing as in stock, but also showing that it is not in stock. £10 says this will be the last time Sainsburys get a quantum physicist to do their inventory. Spotify is compatiblie with the shuffle. That's what i use. Why are any of these Tesco deals still posted? I've got more chance of winning the lottery at 14 million to 1 than finding a Tesco instore deal. Normal price in my Tescos. Boo! The link just takes you to Ryman's website! There are no shuffles on the page. HUKD is ****!!! Is this deal expired yo I can't find the Shuffle on the Ryman's site ? Thanks, that code was RX22 but unfortunately the Ryman site is refusing that to. So I'm not ordering. I'll probably prefer the Nano anyway. 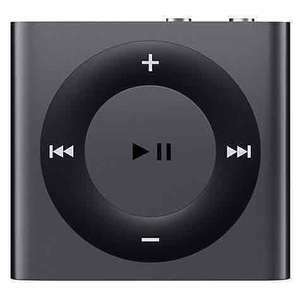 2GB 4th Generation iPod Shuffle for £32.99 @ Groupon photo-direct.co.uk. This is a more of a portable product over memory size. Everyone is entitled to their own opinion, I'm just posting a deal i found! Apple offer a whole heap of different iPods ranging from 2gb to 160gb. 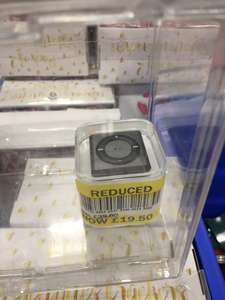 Refurb iPod Shuffle 4th Generation 2GB available from Argos/eBay. Other colours also available in smaller quantities. Can you connect an aux lead to this and listen to the music through the car stereo? I bought it for 24.99 using Wend20. Thank you! No don't think so as the entire iPod line apart from the Classic had a colour refresh around the launch of the 5C and 5S to replace Black/Slate models which scratched and chipped instead with Space Grey. I have two of both. The Sansa has deffo superior sound and more functions, particularly when Rockboxed, if that is your thing. Where it falls down compared with the Shuffle is on battery life - this tends to deteriorate fairly quickly with the Sansa. Added to that reliability issues with Sansas dying suddenly and the fragile plastic clip, which is very easy to break off and you need to decide whether you want a compact player to enjoy your music or a compact player to drown out the rubbish music they tend to pipe into gyms. If the latter, then the Shuffle is better suited. It is more robustly built, has mediocre sound but can be operated by hand without needing to peer at a screen. It can also be operated with Apple compatible headphones (a fairly crappy Apple set is supplied) with controls on the cable - handy if you are running or on a treadmill. Also one trick the Shuffle has up its sleeve - you can download firmware when setting up the Shuffle for the first time that will read out the track name if you hold the play button down for a second or so. Useful for those with poor sight. Great price, great product, heat added. NOt for me though, my old one is still going strong. It's cold because it's iTunes! This is getting voted cold left, right and centre anyway. Cold votes for no apparent reason make me sad. Most people who'd buy this won't be buying it for capacity or capability. It's an attachable mp3 player to use whilst exercising which weighs nothing. Most likely a second mp3 player.